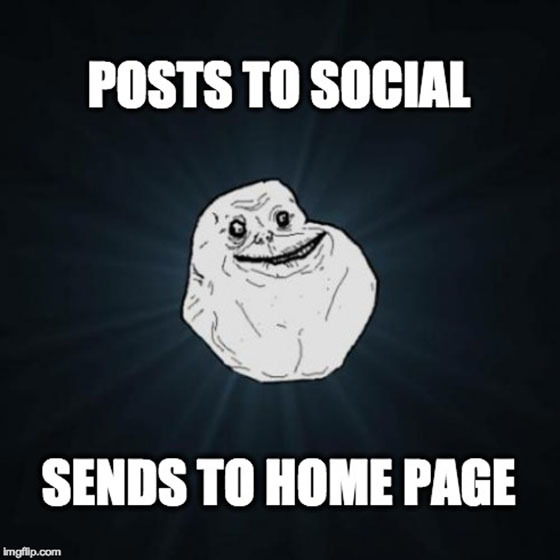 Whether you’re promoting a product, piece of content, event or contest, if you’re not sending your traffic to a dedicated landing page, you’ll live a lonely life as a marketer. When a social media marketer is doing their job properly, they draw me in with a creative social ad or post, then drop me off at a dedicated landing page with one call to action. 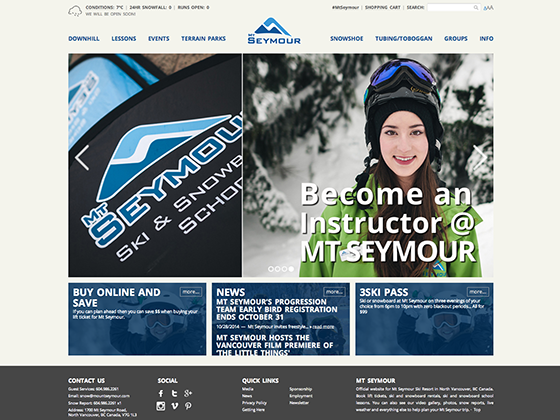 The “Become an Instructor” banner was part of an image carousel. 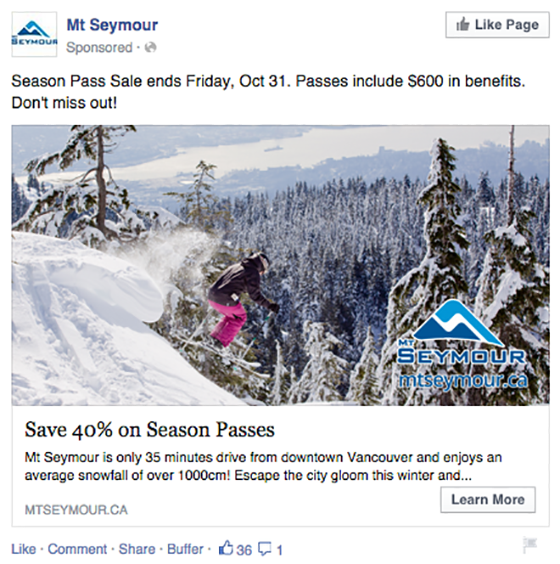 But seeing it after clicking on Mount Seymour’s Facebook ad for 40% off a season pass = shattered dreams. Cold, lost and alone. Not even one mention of a season pass around here, just plenty of distractions. You can’t expect prospects to complete the action you’d like them to take if you’re sending them to a page that doesn’t acknowledge where they just came from (and what they came to do). You can do better. 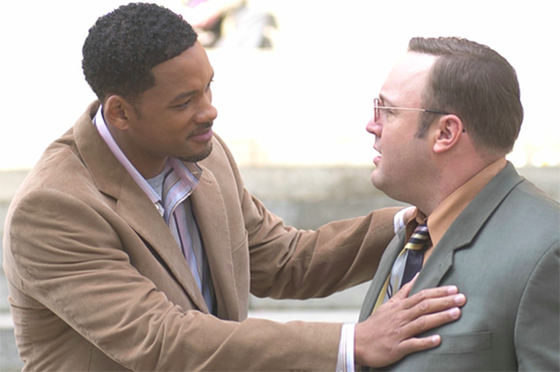 Think of me as Hitch… for your social campaigns. In this post, I’ll show you some companies who recently told me how they used their social channels to convert visitors by sending them to dedicated landing pages. 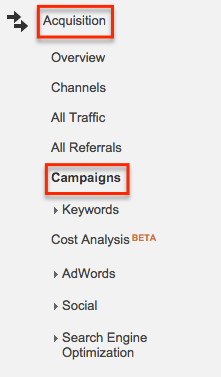 Then I’ll explain how you can set up tracking on your landing pages to measure your campaign performance. Before you know it, you’ll be closing as smoothly as the date doctor himself. If you’re promoting your service or product on social channels, there’s no excuse for sending people to your homepage. Ever. Prospects that are curious enough to click on your ad are likely looking to sign up, so make it easy for them. Shopify empowers small business owners to launch full-scale ecommerce websites for almost any industry. To target their different buyer personas, resident Growth Hacker Demetrius Michael runs vertical-specific ads tied to relevant landing pages. 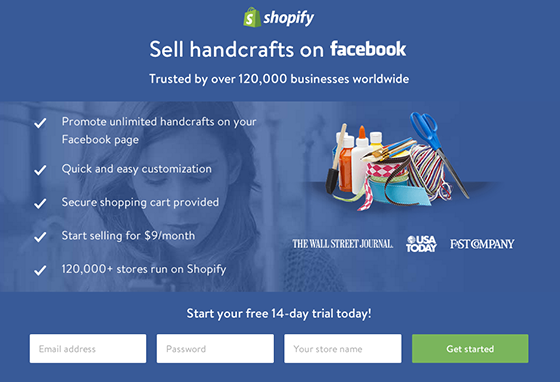 Shopify matches their Facebook ad’s headline to the headline of their landing page. 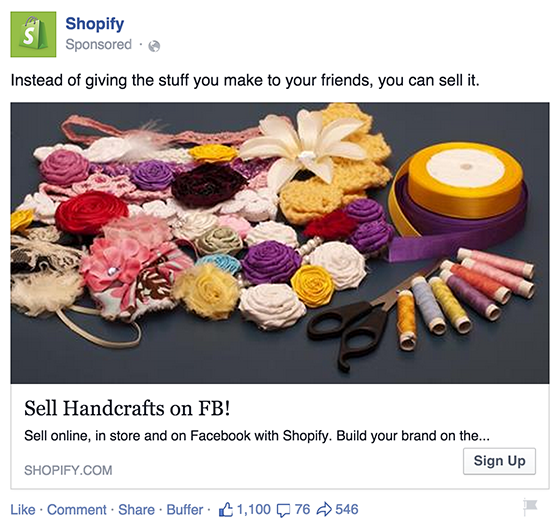 Coupled with dedicated landing pages, Shopify’s optimized Facebook campaigns have resulted in a 10x drop in cost-per-lead (CPL). Selling something? Make sure your landing page’s hero shot accurately represents your product or service (and matches the imagery in your ad or post). A generic picture of a smiling woman at her desk doesn’t exactly illustrate that your software helps make accounting easy. 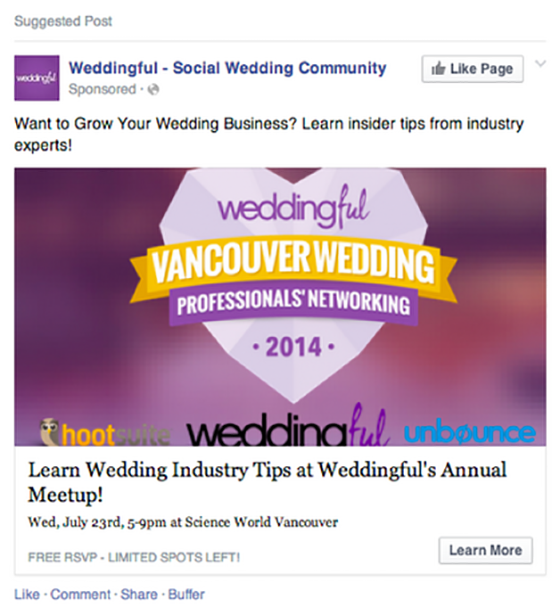 Use icons and images that clearly explain what you’re offering. As an industry expert, you’re a trusted source among your community. Your supporters already follow you on Twitter, like you on Facebook and have you circled on Google+. Why not invite them to participate on other channels using social as a driver? 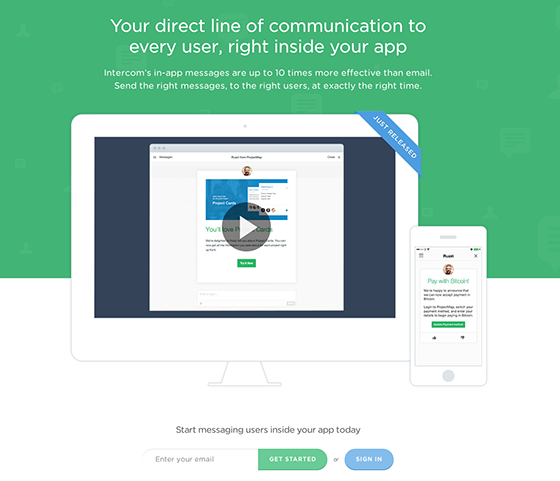 A consistent design across all channels entices curious marketers to click, and the sign up landing page delivers exactly what’s expected. Notice the matching color palette, hero shots and title? 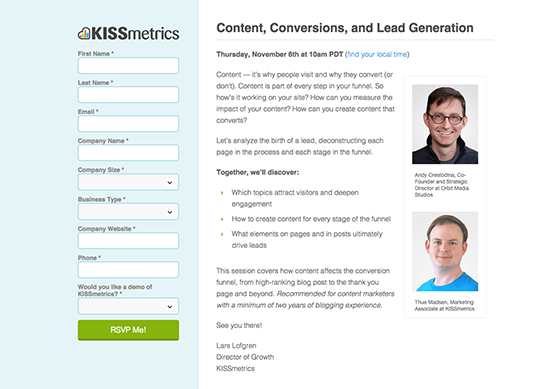 When I spoke to Lars Lofgren, KISSmetrics’ Director of Growth, he told me that webinars help them obtain over 10% of their new monthly leads (and get on average 1500 registrants each). Visitors might be reluctant to sign up if they know they can’t make the live event. Soothe their anxiety by letting them know they can still get the recording if they RSVP. Got something unique to share that’s time-sensitive or unexpected? The goal here is to demonstrate the value of your product without directly selling – and hopefully encourage your prospect to sign up. The more relevant your offer is to their immediate pain points or interests (and the less you talk about yourself), the more invested they’ll feel. And that’s good for conversions. Paid social has been one of the most effective ways for us to generate leads for our sales team. Keeping the user experience cohesive, from the ad image and copy to the landing page design and description, helps improve conversion rates on our form because we create an organized and streamlined process that ties together our ad with our offer. If you’re a retailer running a limited-time offer, run ads that promise 50% off exclusively for social supporters and direct them to a landing page where they can download or print a coupon to redeem in-store. 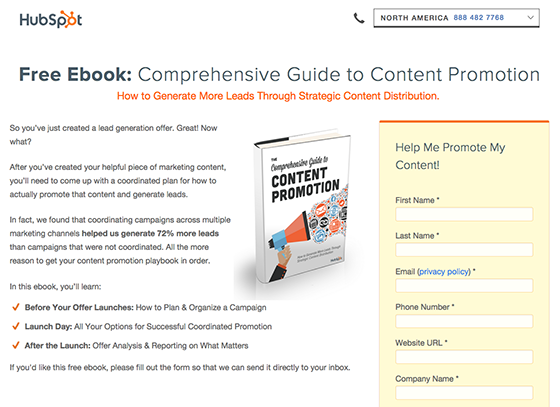 Ebooks are a great way to deliver value to your prospects, but they’re also a great way to attract qualified leads who are researching a solution to their problem. In an ideal world, an ebook will share tons of actionable advice with readers and educate them about your solution. 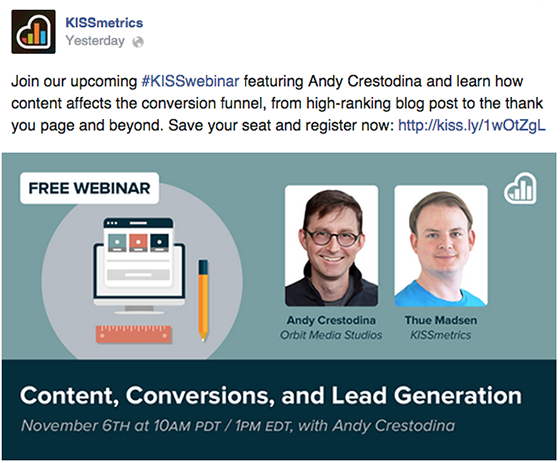 As inbound marketing experts, you kind of expect HubSpot to nail it – but it’s always nice to see a company that practices what they preach! 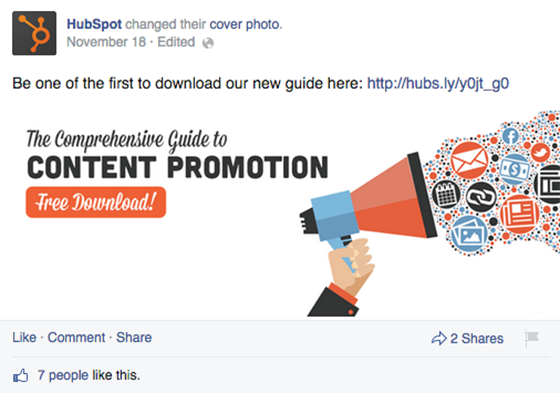 For every piece of content they release, the HubSpot team creates a handful of images that are optimally sized and designed for each social media network in order to encourage sharing and engagement. So how’s this tactic working for them? HubSpot’s Campaigns Manager, Amanda Sibley, told me that for the first day of this campaign, traffic from social media contributed to over 15% of the total views of the ebook. Make sure the length of your form is proportional to the value your visitor will receive in exchange. Use fewer fields if you’re giving away free items like ebooks to reduce friction. Contests are a quick way to boost brand awareness and attract new customers. Centralizing all of the details on a landing page makes it easier to promote your contest through various channels, reach a broader audience, and track which channels get the most traction. 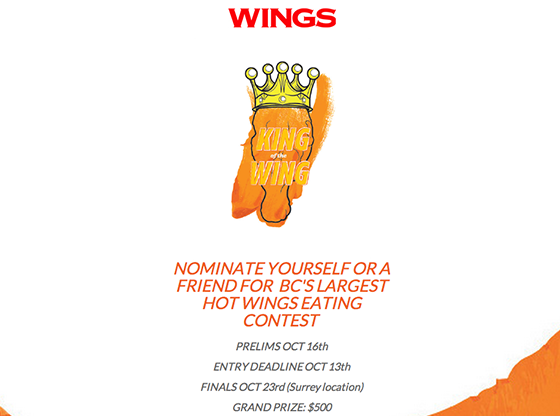 When Junction was tasked with running an annual promotional campaign for Wings, they turned to landing pages to see if they could improve over the previous year’s performance. The result? 117% more participants. 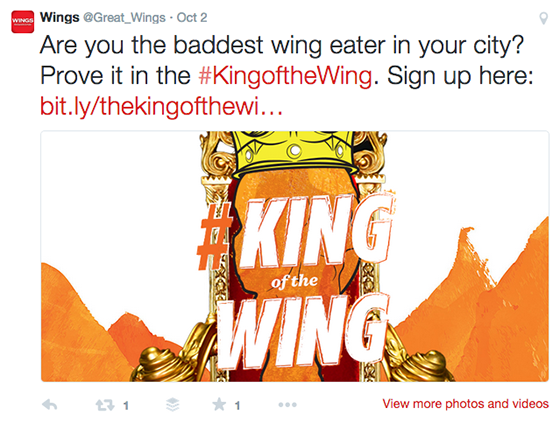 Junction promoted their contest on social channels, including Twitter. 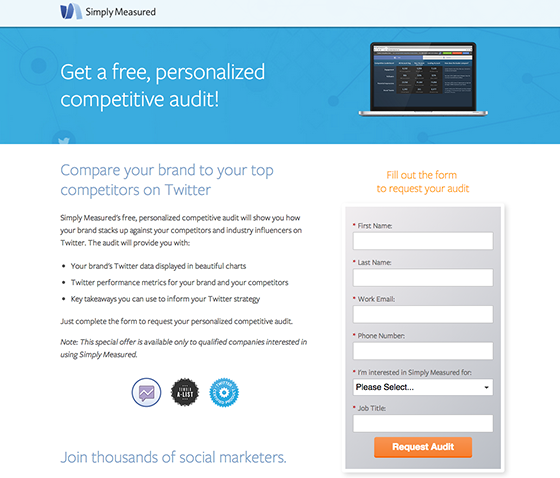 A screenshot of their contest landing page. It’s worth noting that they created a dedicated landing page for each of their three distribution channels, allowing them to serve up the super message-matched content. Wondering which channel converted best? Paid social ads took the cake with a conversion rate of 14%, followed by organic social traffic (9%) and traditional (1% using radio and print). Don’t forget to include all of the rules and guidelines on your contest landing pages! Check with your local compliance laws and include your terms in a lightbox to keep visitors from having to click away. Whether you’re hosting a one-time gala for hundreds or recurring meetups for small groups, landing pages can help you market your event to the masses and easily collect information from attendees. All you have to do is determine your ideal audience and serve them up targeted ads that link directly to your event landing page. 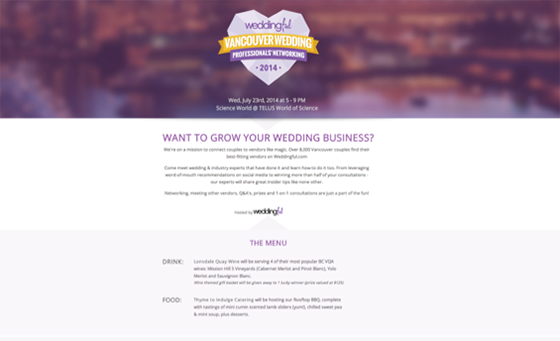 Allowing guests to RSVP right on the page, the Weddingful crew secured responses from 220 industry professionals who were looking to improve their marketing. With an event cap of 200, they oversold their goal by 10%! Not too shabby. For a successful local event, upload an existing leads or customer list into the social platform’s ads manager and use it to develop a targeted ad campaign. Loyal members of your community will be more likely to attend and help spread the word to people within their broader network. Shannon Byrne recently wrote about using landing pages to help validate a feature development idea… but you can also use them to announce the update once it’s ready! 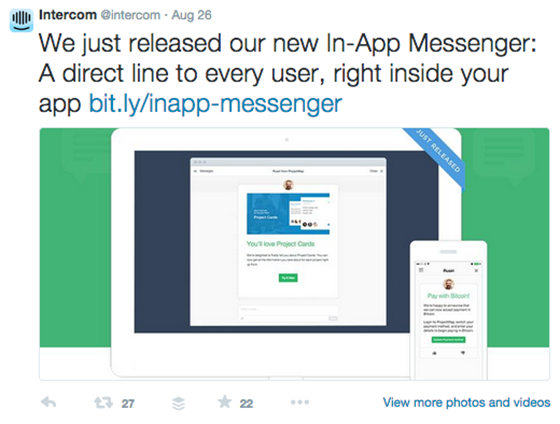 Sharing this update on their social channels and directing prospects to an informative landing page got Intercom 1,643 pageviews and 46 new email addresses directly from a social source. Short videos are an effective way to explain more about a new feature without taking up precious landing page real estate. Keep your message concise and be sure to focus on the benefits. Okay. Now you’re on board with using landing pages for all your future social campaigns, but is all that juicy content you’re pumping out truly benefiting your business? Pulling your hair out wondering if your social promotion is working? You better be tracking that. Come up with an awesome marketing idea (in this example, we’re using the Ultimate LPO Beginner’s Toolkit, the brainchild of our Community Manager, Hayley). 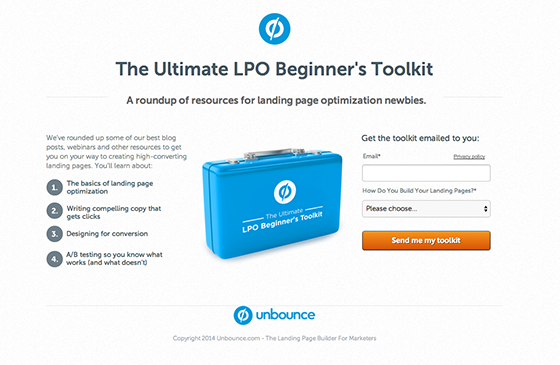 The landing page for the Ultimate LPO Beginner’s Toolkit. 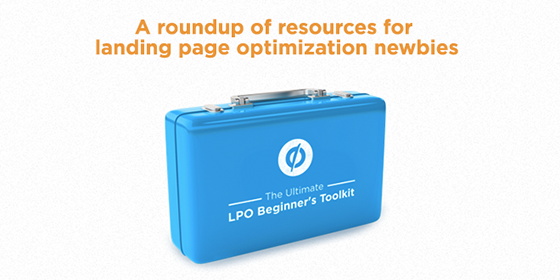 A visual asset for Ultimate LPO Beginner’s Toolkit, complete with message and design match. Make unique, UTM-tagged URLs for each social channel using Google URL Builder. Include the landing page URL, the name of the source (social), the specific medium (LinkedIn, Twitter, Facebook), as well as the campaign name. 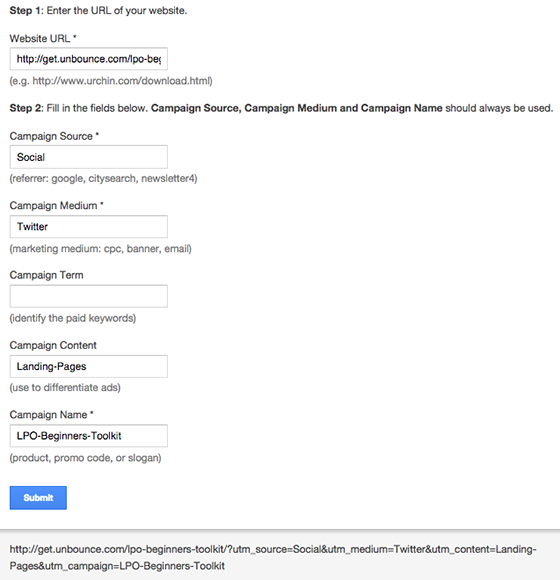 Make sure you add this tracking to all the links you use to drive traffic to your campaign landing page (email links included). Next to the search bar to the right, click the “advanced” text link. Now you can see how many sessions have been started and where that traffic came from, along with a number of other stats. Not much data to see here (yet) as this campaign hasn’t been launched publicly. 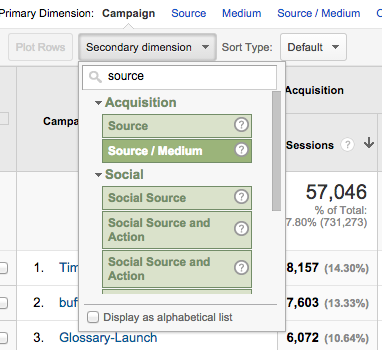 If you have conversion goals set up, you’ll be able to track those as well. AdStage has a helpful guide on how to set up conversion goals if you’re not sure how to get started. Just because you’ve thrown up the tightest ad and landing page combo, don’t think you can drop the mic. Make sure you’re A/B testing both your ads and your landing pages to get the highest conversion rate! Experiment with different headlines, images, button copy or whatever you think could increase your page’s success. For more ideas on how to formulate a solid test hypothesis, check out this post by Michael Aagaard. 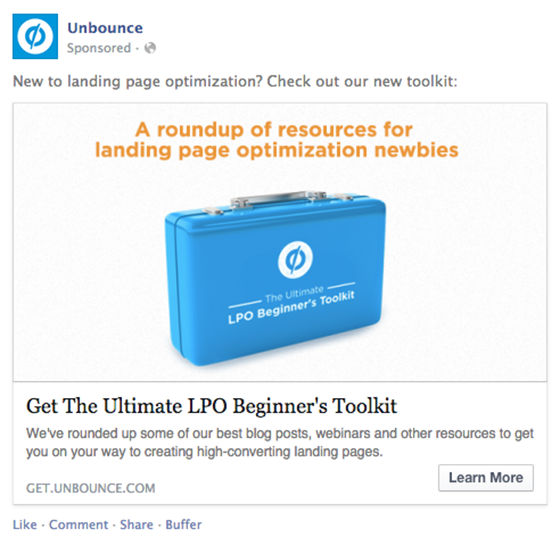 There are so many ways you can use landing pages to help boost your social media marketing efforts — I’ve by no means exhausted the list here. 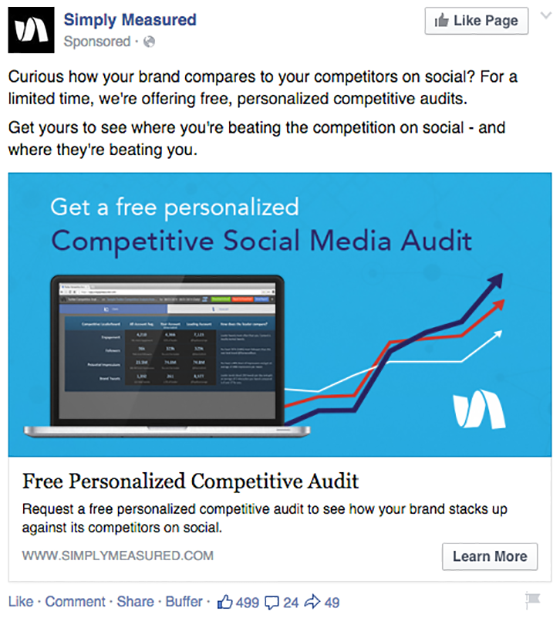 Have you used them in other creative ways for your social media campaigns?